On the left hand side of the screen is the original version and on the right hand side is the most recent version. The SourceWatch database stories all versions of the edit history so you can compare any versions of the article if you wish to check where specific points were added. This will display the entire history of the article including the dates and times as well as the names of the registered users or (for older changes when registration wasn't mandatory) the IP address of contributors. As all versions of the article are saved in the database, you can view either an entire earlier version of a page or compare any two versions. To compare between two versions of an article, from the "history" page, check the two versions of the article you want to compare and click on the "compare selected versions" button. 5. 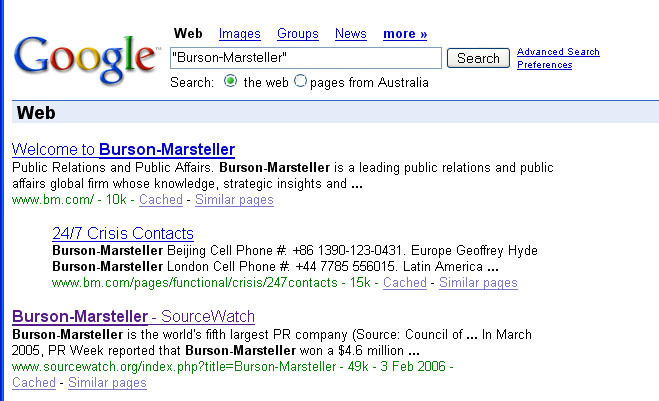 SourceWatch articles commonly turn up high in a Google search. There are a range of factors that affect where a page turns up in search engine rankings. One is how closely the title of the page correlates to the search parameters. 6. What an article page looks like. Click on the "edit" tab and you can change the article, add references or add links to create new article pages. Adding new content is easy in a wiki. To create an internal link to an existing SourceWatch article or to create a link for an article you want to create, enclose the page title in two square brackets. (An existing page link will display as blue, a link to a page that has not been created will display in red. If you click on a red link it will open an edit window to the new page and you can add content directly). 7. When the edit window is opened a formatting toolbar appears. B= bold: Bolding is best used very sparingly but, where it is needed, highlight the selected text with your cursor and click on the Bold command. I = italics: Italics are primarily used for the titles of publications rather than text in an article. Where it is needed, highlight the selected text with your cursor and click on the italics command. AB = create an internal SourceWatch link. Highlight the selected text with your cursor and by clicking on the command it encloses the term or name in square brackets that links to an existing file or creates the link to an as yet to be created article. Globe: the fourth link adds a weblink to a url by enclosing it in single square brackets. (Note for this to work the url included must have the http:// prefix). 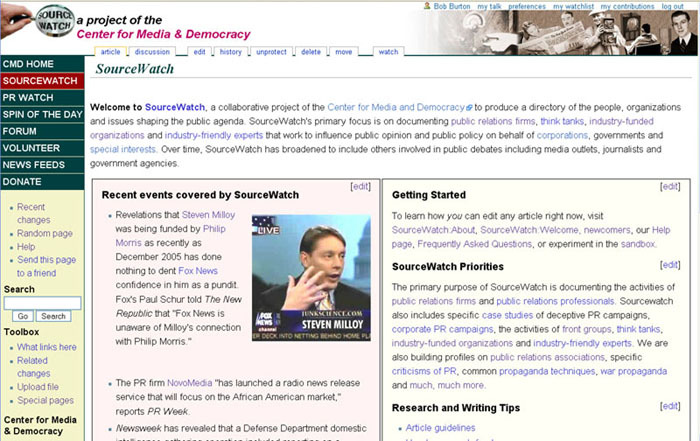 SourceWatch aims to have all key points on an article page referenced so that readers can follow a link to a primary or quality secondary source. See Help:References for more details on how to add references. We also aim to have standardised end sections at the foot of the page. See Help:Standard end sections for a SourceWatch article where you can cut and paste the raw material from, after you click the "edit this page". a link to an article, other than those used to reference text in the article, can be added here. The normal format is Author, [url "title"], publication, date (if there is no publication date add "accessed month, year". (Each article should have at least one category link -- if you aren't familiar with relevant categories, just add one for a country that is related to the page. Other editors can add other categories later). Before you save your changes or additions, you can click on the "Show preview page" command to see what it looks like. 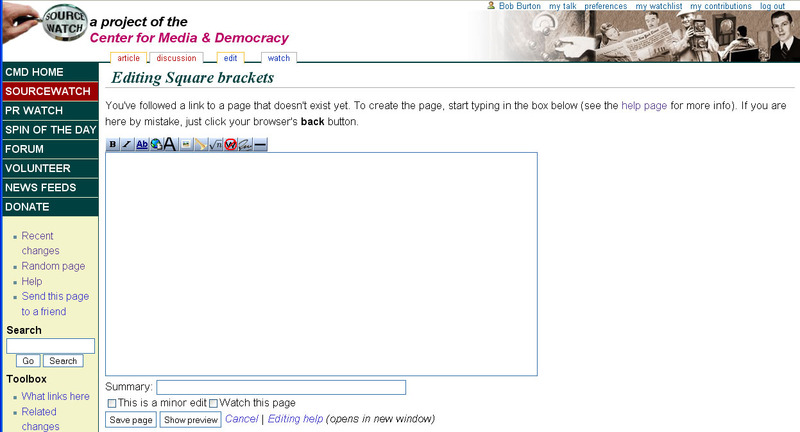 (If you don't want to save your changes just hit the back button on your browser. Remember, inadvertent errors can be easily reverted by you or others opening and then saving an earlier version of the page accessed from the page history page). If you have just made a minor change (such as corrected a typo or fixed a link), check the "this is a minor edit" box and add a brief note in the summary line such as "typo". (Note: some users have their browser set so that they don't see minor changes). If it is a more substantial change, such as adding a new paragraph of text, it is worth adding a brief description of the change you made so other users can judge whether they want to check the change. For example, a note could be something like "added details from annual report on what staff were paid". As noted below, if you deleted referenced material you should post a brief explanatory note to the "discussion"/talk page. That's enough to get you started with editing article pages. SourceWatch can accommodate photos (copyright-free only please), Adobe Acrobat files (Pdfs), sound files and diagrams. Photos should be kept to a reasonably small file size consistent with maintaining reasonable quality. (Remember, many web users are on slow dial-up connections and slow loading pages are less likely to be read.) Acrobat files, sound files and diagrams can be incorporated where material is important to the article and otherwise unavailable on the web). See SourceWatch:Uploading Images & PDFs for more details on uploading files. 11: Parallel to each article is a "Talk" page (access by clicking on the "discussion" tab). Contributors who want to express an opinion on a page are welcome to do this on the talk page. The 'talk' pages can also be used to post a tip for other contributors or add a query. When you have finished drafting your text for a talk page, it is best to click on the second tab from the right on the edit buttons "your signature with timestamp". This will add your user name and date & time so that other users can follow discussions on the page. If you want to experiment with formatting commands without risking doing any damage to an existing article, you can play to your hearts content in the SourceWatch:Sandbox. This page was last edited on 23 September 2009, at 03:36.